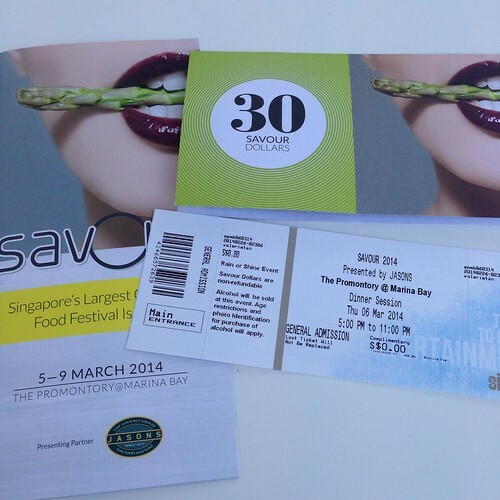 I checked out SAVOUR 2014, the third edition of the annual alfresco gourmet event, last Thursday evening. 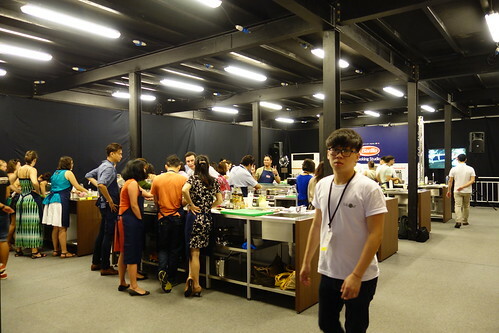 The 5-day foodie festival filled with gourmet delights and showcasing the expertise of international guest chefs and Singapore-based chefs ran from 5 to 9 Mar 2014 at The Promontory @ Marina Bay. It was a very warm day so I was grateful for the cool sea breeze that blew over the SAVOUR Village and the refreshing Brain Freeze that my hosts, Stellar @ 1-Altitude and Heat Branding, served me. 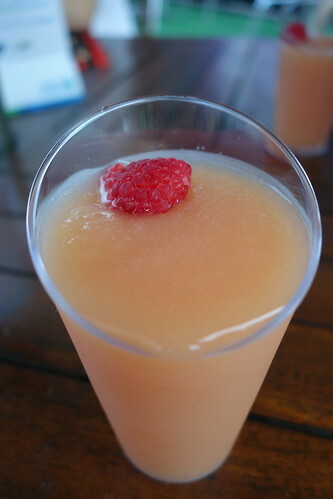 The ice-blended concoction of Pink Guava, Pineapple and Belvedere Vodka was a fruity thirst quencher without being overwhelmingly alcoholic. 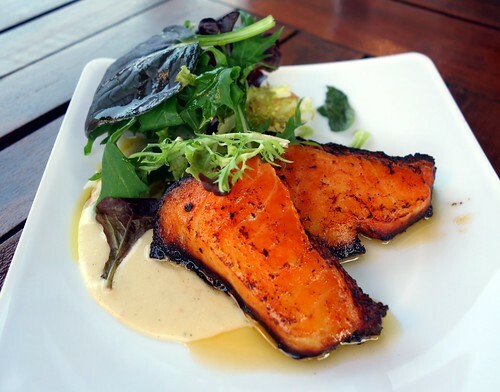 Worth a try if Stellar, helmed by Chef Christopher Millar, serves it on their regular menu. Next, we shared a Mixed Meat Platter that comprised Smoked Wagyu Rib Eye, Kurobuta Pork Crackles, 24 Hour Braised Short Rib, Dijon Mash, Soy Caramel, Port Jus and Smokey Bearnaise Sauce. The Smoked Wagyu Rib Eye was moist, flavourful and tender. The Kurobuta Pork Crackles had a lovely browned and crunchy crackling and juicy meat even though it appears to be quite dry in the photo. The fork tender 24 Hour Braised Short Rib was perfectly infused with the rich flavours of the robust soy caramel braising liquid while the creamy Dijon Mash added a touch of starch without being stodgy. Definitely a Must-Try at Stellar as the good news is, it's on the menu! Unfortunately, Stellar had sold all 20 Ultimate Burgers for the dinner session by the time we arrived so we had dessert to wrap up our Stellar at Savour 2014 experience. 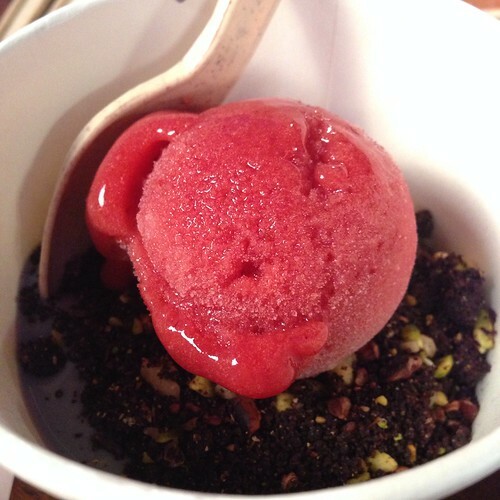 The Strawberry Blossom Sorbet was refreshing without being too sweet and it went perfectly with the crunchy chocolate "soil" and lovely violet cream beneath it. I couldn't find it on the restaurant menu as many of these dishes were created just for the occasion, perhaps they will eventually make their way to the a la carte menu so that more people can savour them. Whilst strategizing how we were going to maximise our tummy room without spending too much (average spend is about $60 in vouchers per head), we were surprised by J's friend who brought us 3 dishes from &SONS. 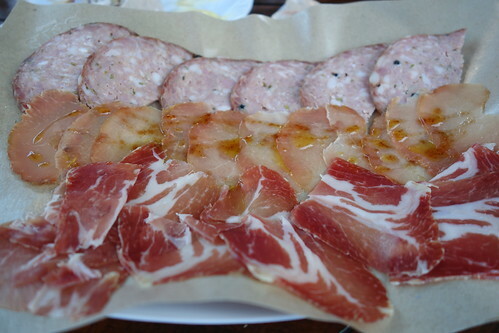 The Home Cured Salami Platter was tasty without being excessively salty and so we could enjoy them on their own. I wondered what Nduja was and found out later that it was a spicy, spreadable Italian pork sausage. That explains why this crab linguine was exceptionally tasty! I was told that this restaurant, helmed by Chef Riccardo Catarsi, is extremely wallet-friendly and serves a portion for just $9! Boy, this place is fast moving up my list of places to check out! This is also a Must-Try! The Roast Cod had most of us "ooh-ing" with delight at the table although I couldn't help but note how salmon-like the cod looked due to the salsa rubra marinade. The moist and tender flakes of sweet cod flesh tore off easily with a fork and was perfect with the smoky, blackened skin. Definitely a Must-Try! 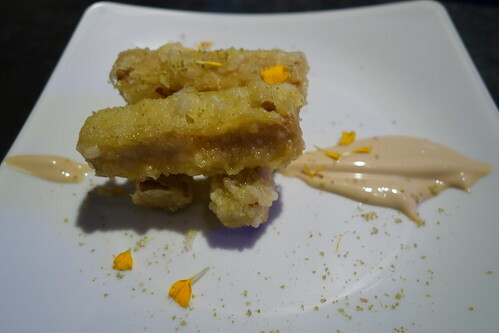 Helmed by Chef Emmanuel Stroobant, St. Pierre's Foie Gras Terrine Tempura was highly-recommended. However, we kept bumping into friends so by the time we ate it, the dish had cooled a little too much and seemed pretty greasy. Otherwise, the tempura batter was still rather crisp even as the oil started oozing out. The lobster mayonnaise was rich and creamy, I can imagine myself slathering it over some lightly toasted Brioche and making a lobster or crab sandwich. This is one of my favourite dishes at local restaurant, The Disgruntled Chef, helmed by Chef Daniel Sia. 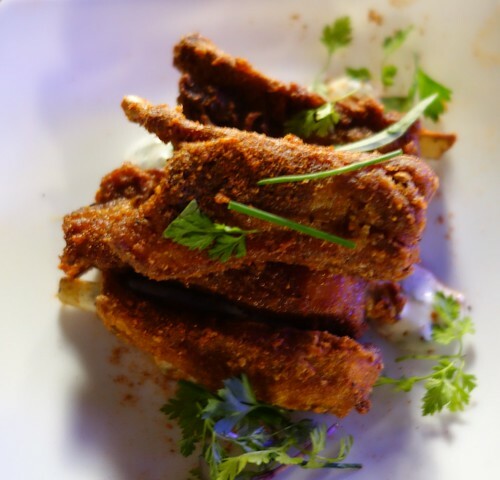 Some friends had never tried it before but were determined to visit after trying the crisp-crusted and juicy lamb shortribs. A Must-Try at the restaurant. 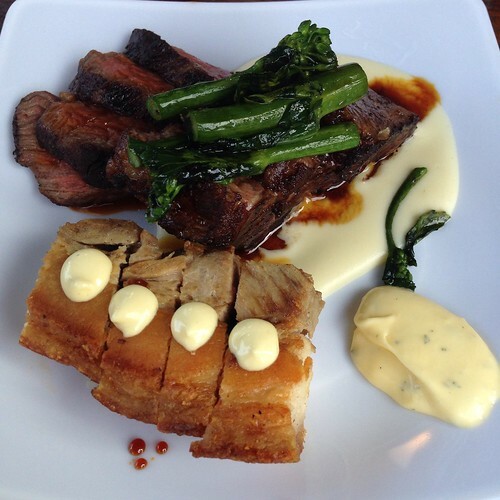 A recent entrant into Singapore's competitive dining scene is Restaurant Labyrinth. Helmed by Chef Han Li Guang, the former corporate banker deconstructs Asian favourites with the aim of reconstructing them with a twist whilst preserving their distinctive flavours. Hence, the Singapore Chili Crab dish was born. 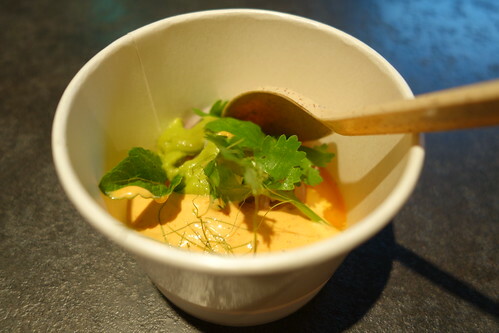 In keeping with Savour's tradition of serving tasting portions at a fraction of the regular menu price, a half portion of the dish was served during the event. I tried the full portion a few weeks back during a preview at the restaurant and enjoyed it even though I'm not a fan of Chili Crab. The key difference was that the Chili Crab ice cream did not have the overwhelming flavour of sweetened tomato ketchup that I hate in local versions of the dish. 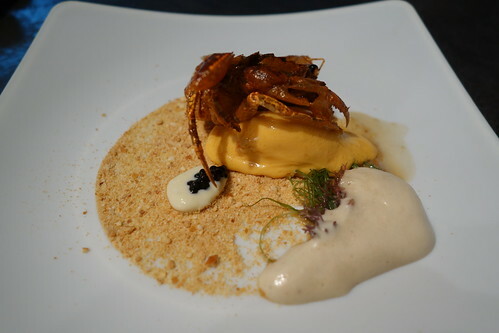 The caviar topped crab mousse and crab bisque foam added a creamy umami touch to the crisp soft shell crab. The toasted Mantou (Chinese bun) that was whizzed to form the "sand" and seaweed gave the dish a "swept ashore" appearance. 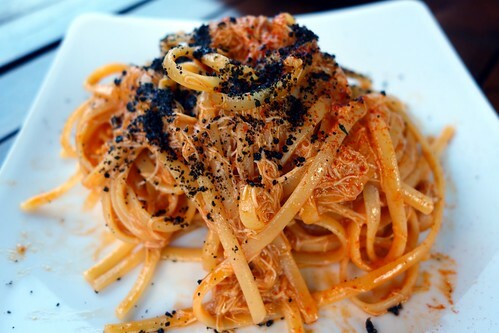 This dish is a Must-Try at the restaurant. Interestingly, part of the inspiration behind the Chili Crab Ice Cream was Kiin Kiin's Frozen Red Curry with Prawn & Coriander Salad. The ice cream melted quickly on a warm evening but we enjoyed the savoury and delicately spicy curry with firm prawns and lychee chunks. I hope I'll be able to try this dish at Kiin Kiin some day as I think though Savour provides us with a preview of what to expect, nothing comes close to actually dining at the restaurant. This is a Must-Try if you are visiting Kiin Kiin. This dish was a little too spicy for my friends so I was the lucky one to have most of it to myself. 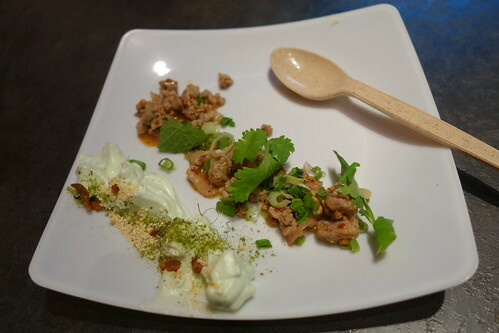 The burn from the spicy and tangy minced duck was mitigated in part by the yam meringue. Tasting a little like a spicy, tangy Thai Tang Hoon Salad (Yam Woon Sen - that is sometimes served a little too sweet for my taste at some Thai restaurants), this dish whetted my appetite even though I was sure I didn't have room for any more food. This is a Must-Try if you can handle the heat. 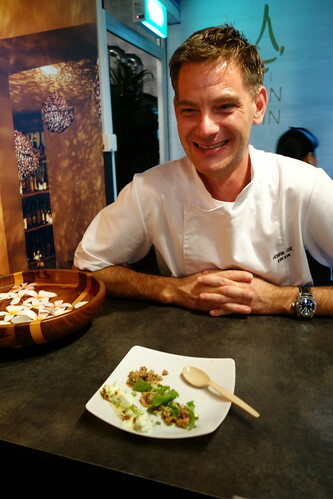 Chef Henrik Yde was a friendly and down-to-earth person although he seemed a little camera-shy. 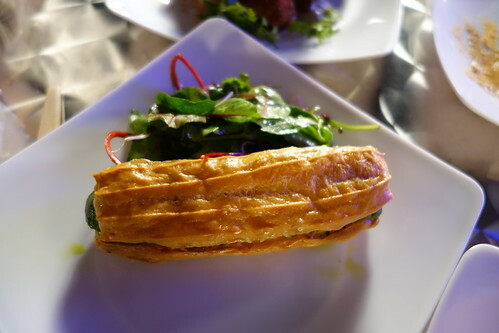 The Escargot Eclair was highly recommended by D. Even though I generally do not like to eat Escargot, the garlic butter and tomato sauce along with the light, crisp choux pastry made for an excellent dish. I hope to try this dish some day at the restaurant in Tokyo. A Must-Try if you're in Tokyo. 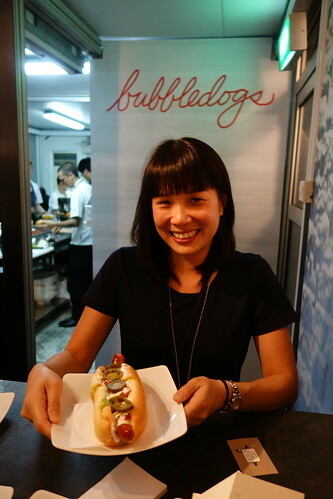 Run by a husband and wife team, Bubbledogs is a casual restaurant in London that serves gourmet hotdogs with in-house baked hotdog buns paired with grower champagne. I loved the José Gourmet Hotdog because I basically love good sausages, Guacamole, Sour Cream, Salsa and Jalepenos. I hope to try their gourmet hotdogs with grower champagne one day as I was told that the ingredients used here were different from the ones used back in London. Gourmet dogs with grower champagne is a Must-Try for the comfort food factor. This dessert had mixed reviews from the group. J and I loved it for its tart flavour although I wasn't too hot on the less than crisp salted caramel popcorn. 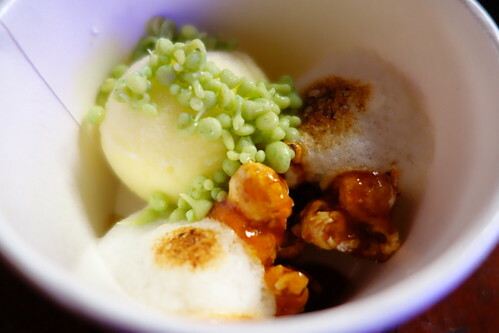 The slight bitterness of the Kaffir Lime and Preserved Kumquat seemed enhanced by the salt in the salted caramel popcorn. I preferred to savour the tangy elements of the dessert without the popcorn. We wandered around the village a little and checked out the cooking class by Chef Michael Caines (Gidleigh Park, UK - 2 Michelin Stars) that was in progress by far more hardworking Savour attendees. What a pity we had to give the Masterclass by Celebrity Chef Mark Best (Marque, Australia - 2 Chef Hats) a miss as we had to rush somewhere. I hope to attend some of the masterclasses next year. Just when I thought I was done eating and could call it a day at Savour, I bumped into L who insisted that I had to try an ice cream sandwich. As I love tea, I thought I would go for something different. It was a generous serving of lovely bergamot-scented tea ice cream and a slightly zesty lemon cookie. I wished I could have had the appetite for more but am thankful that I can still buy them locally. 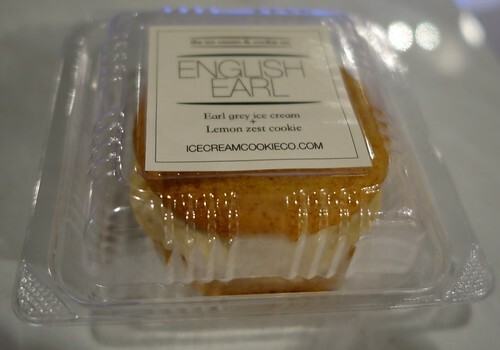 The Earl Grey Ice Cream & Lemon Zest Cookie is a Must-Try if you love Earl Grey Tea and lemon! The evening that I spent at Savour 2014 has left me yearning for next year's event although I hope they will reduce the entrance fees for the evening sessions. This year's tickets for the evening session cost $65 (inclusive of 30 Savour Dollars worth $30). Thank you, Stellar @ 1-Altitude and Heat Branding for the hospitality.